I was beyond excited to return to Savannah last week. My first visit a few years ago was just long enough to pique my interest in this unique and historic city. I couldn’t wait to go back for more! This time I traveled alone but it was with my girlfriends in mind. What would my buddies like to see? What Southern-Fried activity was so memorable, I’d do it all over again? Well, I came up with five good ones from this trip. That’s not to say there isn’t much, much more to see and do in this charming town. But here’s what I’d tell my girlfriends NOT to miss. Old Savannah Tours – There are numerous ways to tour the city, but I think the best and most cost-effective way to get started is by buying a ticket for a trolley tour with Old Savannah Tours. That’s the creamy white trolley. On my first visit, we toured on the green and orange trolley and that was good – but Old Savannah Tours is even better. You can buy a ticket for a 90 minute tour of the city, or pay just a little more and get the hop on/hop off ticket for the full day. If it’s your first trip to Savannah, stay on for the full tour, then go around again to jump off anyplace interesting. Your transportation is covered for the day. 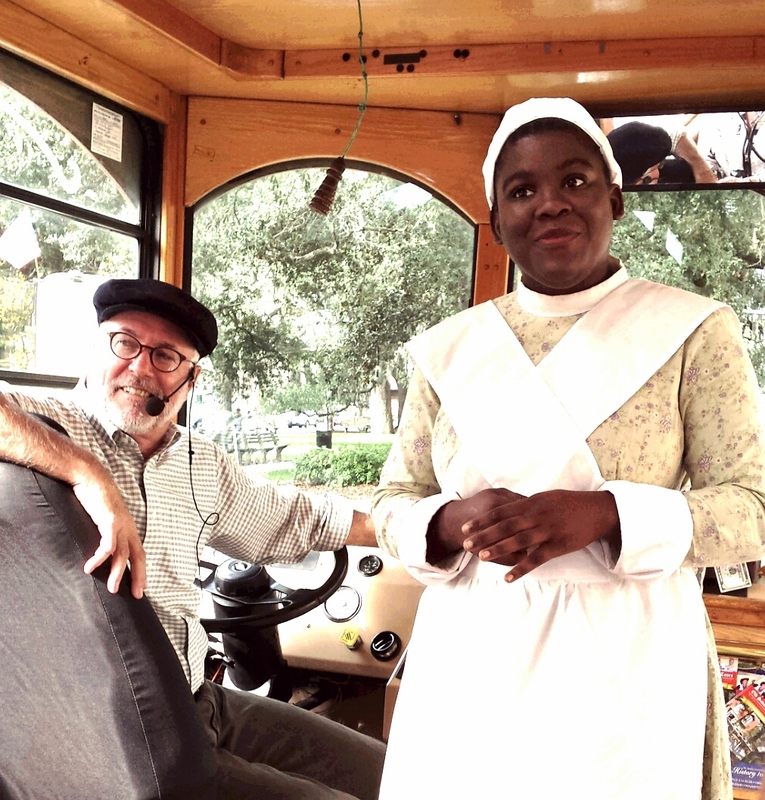 Historic characters in costume hop on the trolley to tell their stories. This is Susie Baker King Taylor, emancipated slave and first African-American teacher in Georgia. She also nursed black soldiers alongside Clara Barton in the Civil War. Our driver and tour guide was delightfully entertaining and knows his hometown inside out. 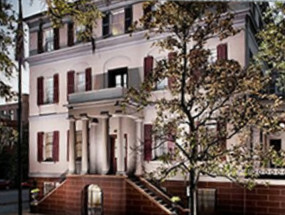 The beautiful home of Girl Scout Founder Juliette Gordon Low is on Bull St., just down a bit from Wright Square. Photo from cleveland.com. don’t have to be an old Girl Scout (like me!) to enjoy touring this Southern mansion. The intrepid Juliette Gordon Lowe was so impressed with Britain’s early boy scouts, she decided to start a program for girls in the United States in 1912. Not only is her home beautifully maintained in the period of the day, but it’s haunted (great stories!) and if you are nostalgic about your scouting days, the gift shop has memorabilia that will have you reciting the pledge with a tear in your eye. 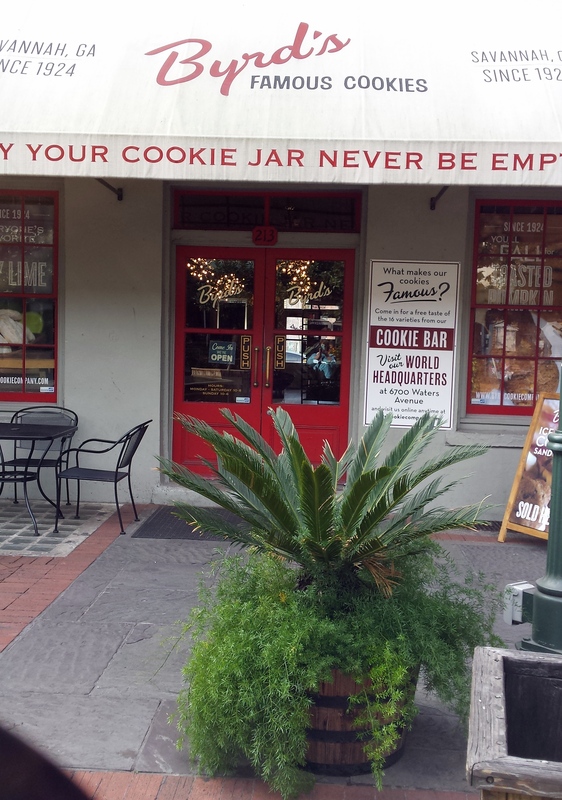 Byrd Cookie Company – You don’t have to be a Girl Scout to love cookies and the delicious little morsels on offer in the company’s City Market store on St. Julian St. are a treat. Ben T. Byrd started making and selling his cookies in 1924 and today you can purchase bags of bite size crunchy goodness in flavors like Georgia Peach (of course! ), Scotch Oatmeal, Chocolate Macaroon and Key Lime Cooler (my favorite). This store was recommended to me by my friend Chris – thanks, buddy! Purchase fancy packages of these yummy little cookies to take home as gifts, or buy them by the pound to enjoy on the spot as you wander around the City Market with your girlfriends! Gullah Living Studio – Next to Byrd Cookie Company is the entrance to the City Market Art Center, filled with galleries and working studios of local artists. Look for some great talent there and be sure to go up to the second floor to see Samantha Claar and her Gullah-inspired paintings and other artwork. Gullah refers to the descendants of West African slaves who lived in the Low Country – a somewhat isolated part of the Atlantic coast from South Carolina through Georgia. Sam’s vibrant work depicts slice-of-life activities as simple as hanging laundry or fishing on the river. A print titled “In the Kitchen” spoke to me and will hang in my new kitchen as a reminder of beautiful Savannah and its friendly people. 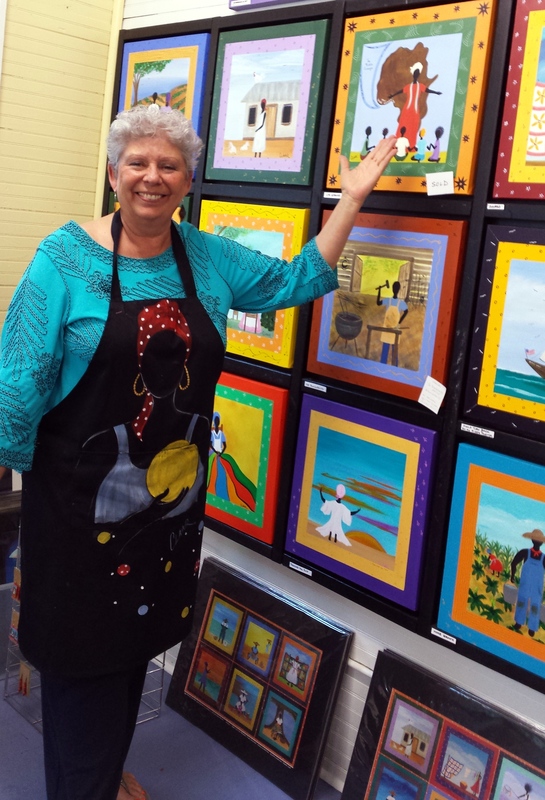 Sam Claar’s Gullah art evokes a simpler time and life by the sea in the storied Low Country. Bonaventure Cemetery – First, allow me to introduce you to Angela Sergi of Savannah Heritage Tours. I don’t care if you drove to Savannah and can tootle off to the cemetery made famous by Midnight in the Garden of Good and Evil all by yourself. You won’t appreciate a fraction of what you’re seeing without a knowledgeable and entertaining guide like Angela. Her stories are fascinating and she is a wonderful guide. In fact, when I return with my girlfriends, I’m going to ask Angela to take us on her combination Historic District and Bonaventure Cemetery Tour and maybe even her Book and Movie Tour, too. She’s that good! 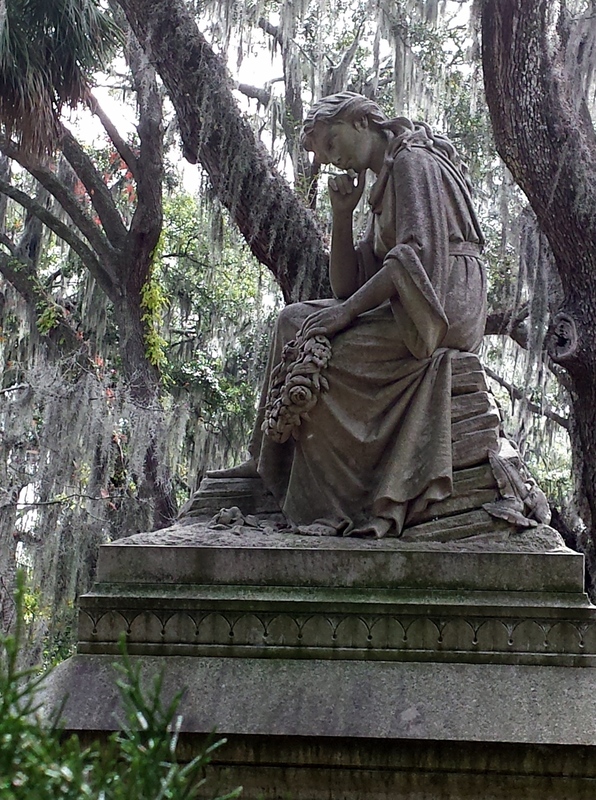 Mourning angels, Confederate soldiers’ memorials, and poignant stone testaments to the memories of loved ones lie in the shade of live oaks draped with Spanish moss on the bank of the Savannah River. Don’t even get me started on all the other things there are to do in Savannah. That city is unquestionably one of our country’s precious historic gems. You seriously could spend a week there and not see everything. If I had that week, I’d also make the time to dip my toes in the ocean and walk the sandy white beach on nearby Tybee Island. It’s just 18 miles away from Savannah and perfect for relaxing and soaking up the sun after your busy days exploring the city. In fact, I can just picture a week at a rental cottage on the Tybee beach with frequent forays into Savannah to see the sights with some of my fun-loving friends. Who’s in? Call me, ladies! Bye for now – Happy Thanksgiving! – and I’m thankful that you’re reading my blog! This entry was posted in Travel and tagged Bonaventure Cemetery, Byrd Cookie Company, Georgia, Gullah Living, Juliette Gordon Low, Low Country, Old Savannah Tours, Samantha Claar, Savannah, Savannah Heritage Tours, Susie Baker King Taylor, Tybee Island. Bookmark the permalink.